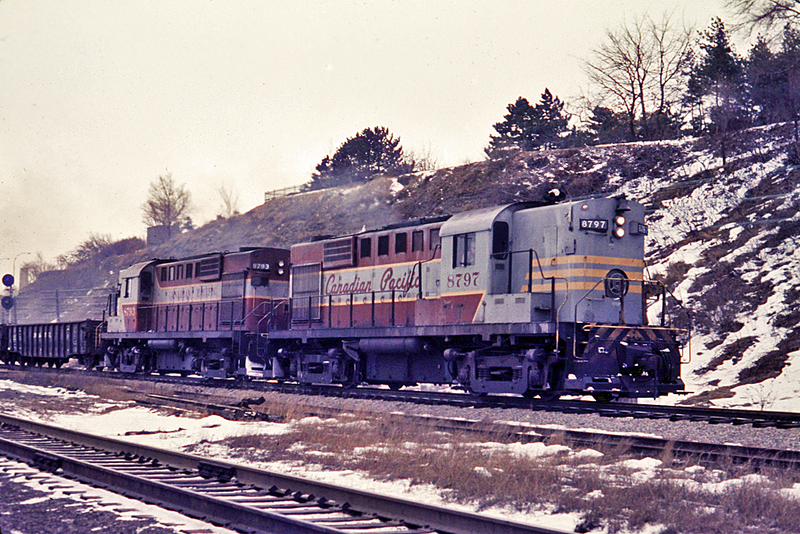 Railpictures.ca - Dave Burroughs Photo: CP 8797-8793 head up what is now CP’s Hamilton Sub. toward Guelph Jct. According to Paul Duncan’s web site, this may have been the Goderich Sub at the time when this picture was taken. I am hoping that I got the geotagging correct as it is hard to pinpoint today with all of the vegetation growth covering landmarks on google maps. I believe the railing that you see in the middle of the picture is the lookout at what is now the McQueston plaque off York Blvd. in Hamilton. | Railpictures.ca – Canadian Railway Photography – photographie ferroviaire Canadienne. Caption: CP 8797-8793 head up what is now CP's Hamilton Sub. toward Guelph Jct. According to Paul Duncan's web site, this may have been the Goderich Sub at the time when this picture was taken. I am hoping that I got the geotagging correct as it is hard to pinpoint today with all of the vegetation growth covering landmarks on google maps. I believe the railing that you see in the middle of the picture is the lookout at what is now the McQueston plaque off York Blvd. in Hamilton. Thanks Ronald for the info especially about the crew booking rest. That is something that I did not know. Re John Eull’s comment…it is most likely the Aberdeen turn. It was run at any time out of the Quebec St. East Pool when traffic warranted. Most common time was ordered London for 1800 or so, turning out of Aberdeen upon arrival which could be 12 hrs later or less. If the crew booked rest on arrival they slept in the van (hogger in a room at the shop) so that could be the case here, or it was ordered later out of London and turned on arrival.. The diamond with the cowpath between CN/CP connector is also most interesting in Steve Danko’s shot! You got me thinking about that. That middle track is a dead end track and can be seen in sdfourty’s pic here. So, the track in the foreground seems to be the cowpath. Thanks for raising the question. It would be nice if anyone could shed some light on the track arrangement here in the late 60′s. OK, Dave…I thought you were standing in the south end of the cowpath and I couldnt figure out what it was — it seems that CN cowpath track is really small rail? Dave there is only two tracks today up the path…what was the middle track in this pic – back then? Thanks for the info John. I also though I answered the question about the middle track being the Cow Path track. The second main track is not visible at the bottom left corner of the pic. Great shot of favourite engines, Dave! what was the middle track?